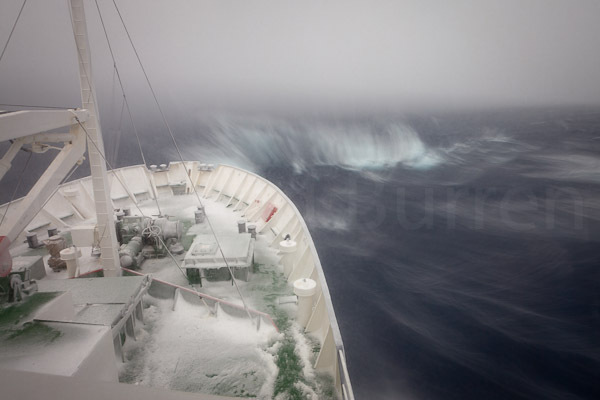 I made this image in late March 2011 while on a ship crossing the Drake Passage, going from the Antarctic Peninsula up to the Falkland Islands. In fact this was the same LuminOdyssey expedition that we were heading to when I made the recently-posted images in the Buenos Aires cathedral. As you hopefully sense, I was trying to capture a sense of the wild conditions this stretch of sea is renowned for. The deck of the ship is covered with snow and ice, while the wind has whipped the waves into a frenzy. I made the image through the bridge windows on our ship (Aurora Expeditions‘ Polar Pioneer). I went through some unusual contortions to get it, which is why I’m telling the story now. I wanted to capture the waves in a blur, so I knew I wanted a slow shutter speed. But I also knew that I wanted at least part of the image to be sharp (to give the image a visual “anchor”). The ship was rolling and pitching in the heavy seas (I think some of the passengers were lying in their bunks wishing it was all over) so I set up my tripod so that the camera would move with the ship during the exposure. However my travel tripod is not very tall, and wouldn’t position the lens high enough for the view I wanted. Also I wanted to get the lens as close to the window as possible (with the wind mainly coming from behind us there wasn’t a lot of spray on the glass, but I wanted to throw that out of focus). So I collapsed the tripod legs, but spread them out as far as they would go. I use tripods without centre columns, so I have the freedom to go down to almost “ground level”. I swung the ballhead to one side, so the lens was pointing “down” through the legs. By pressing the spread tripod legs against the window, the camera lens was pointing out the window at almost point-blank range. I did need to stand there holding the rig against the window during the exposures, but on a pitching and rolling ship with the engines going, any slight vibration from me wasn’t going to be an issue. I had a remote cable attached so I could press the rig against the window with one hand while triggering the camera and manipulating controls with the other. The camera I was using was the EOS 5DmkII, with the 17-40mm/4 L lens. If I’d planned ahead I would have brought a dark cloth to the bridge with me to drape over the rig to cut out reflections from the glass, but as it was I just had to experiment with zoom settings to avoid including reflections of the starboard windows. As it is you may see a slight reflection on the right. It took some experimentation to find the right amount of blur. I started at 2/3rds of a second and gradually slowed it down until I reached 2.5s, checking the results on the LCD as I went. This particular photo was made at 2s, f/11, ISO 100, with a 6-stop ND filter on the lens (zoomed to 22mm). With a 2s exposure, the horizon has been severely blurred as the ship rolled, although visually it blends into the mist. The main processing that’s been applied to the image is adjustments to the Exposure, Blacks, and Brightness sliders in Lightroom, plus a slight crop. My cameras are set up with “rear focus”. That is, even though the lens is set to AF it only auto-focusses when I press the rear AF-ON button: it doesn’t re-focus each time I press the shutter. So here I put the camera into Live View, zoomed the LCD 10x into the anchor winch, and pressed the AF-ON button. Once the focus was perfectly on that point I went out of Live View, and didn’t touch the focus controls again. I often use LV for focussing in landscape and architectural photography. From then on it was just a case of waiting for a passing wave to get into the right position, take some photos, and check the LCD to see if I liked the result. I stayed there for about half an hour trying different settings and shooting different waves (including from the other side of the bridge) but this shot was 20 minutes into the exercise. I didn’t take many other photos this day: the heavy seas continued unabated! Meanwhile, each photographer who came onto the bridge during this time wanted to know what on earth I was doing. It was easy to show them recent images on the LCD, and I think the final result was well worth it!